A little update for you all: I’m 36 weeks pregnant now! Almost ready to pop and have been put on modified bedrest to help stop our little baby girl arriving any earlier than she needs to. This means I’ve now got some extra time on my hands, and as much as being in bed & watching TV sounds great, I’m already looking for other things to keep me busy. I’m trying to compile a list of meals to prep and freeze before her arrival and of course, I’ve been thinking about some sewing plans. At the moment they are just plans as I need to try and set myself up on the sewing table so that it’s comfortable for my hips and pelvis…maybe pillows strapped to the bench?? We’ll see! 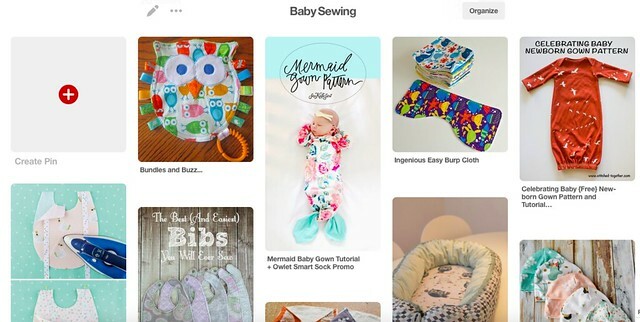 Pinterest has been a great source for ideas and I’ve been quite surprised at how many free baby sewing patterns I’ve found. I’ve started putting them onto a little Pinterest board but just picked a few out that I’m going to start with. As I know that I’ll be slower with projects than usual, I’ve chosen narrowed it down to ones I think will be useful to me straight away. It seems that there are a lot of baby sewing patterns out there that are extremely cute but somewhat lack usefulness…I’ll be making the cutesy things further down the line! The first project on my list is burp cloths. I really like how these ones from So Sew Easy are contoured for an easy fit on the shoulder and they fold neatly into a nice pile. There are quite a few fabric options for these; I think I will use some cotton on one side with French Terry or cotton flannel on the other side. I’ve also read that it’s useful to put some quilt batting between layers to increase absorbency. 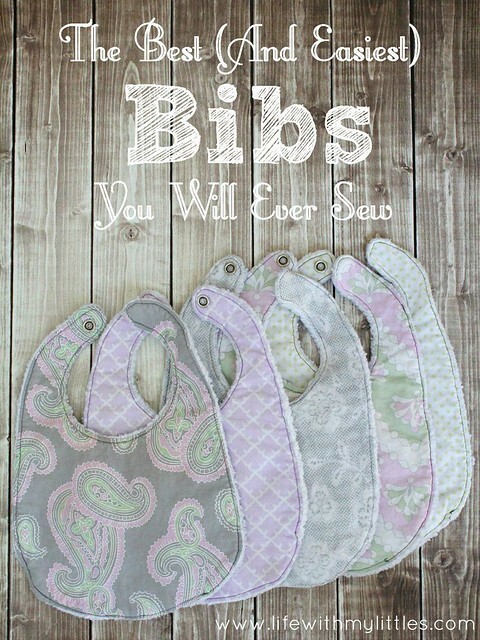 Next up I want to make a few bibs using this pattern from Life with my Littles. The construction looks very similar to how the burp cloths are made, only these bibs will also give me the opportunity to use snappers for the first time. Again, absorbent fabric will probably be the best option for these so I’m going to opt for cotton flannel and fleece. 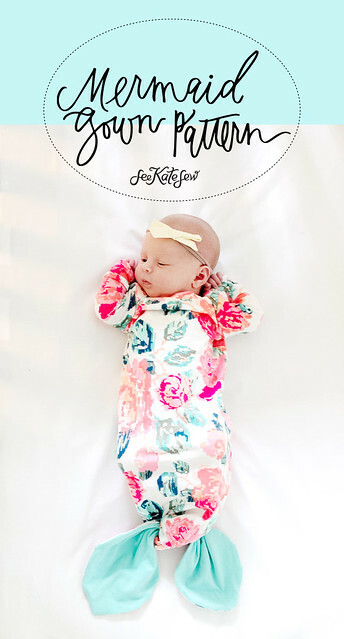 I was so pleased to find a free pattern for a baby swaddle! 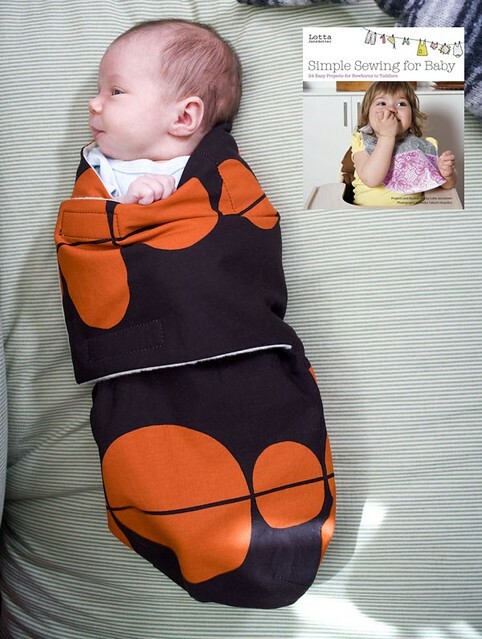 These things are much more expensive than I ever thought and I’ve read a lot about how useful they are if you have problems with swaddling a baby using just a blanket, where they look like a little wrapped burrito. This pattern looks like it’s originally from this book by Lotta Jansdotta but it’s available as a PDF download here. I’m really looking forward to testing these out as an easy swaddling option. The last project that I’ve picked out is this adorable Mermaid Baby Gown from See Kate Sew. I’ve used patterns from See Kate Sew before and have always been impressed with how clear the instructions are. I like how this pattern has two options for the bottom of the gown: the mermaid tie or the simple elasticated bottom. Coincidentally I’ve also bought the exact same stretch fabric that one of the examples is made from so I might just have to use that for this project! So my patterns are printed and Adam has lifted the fabric box down for me. I’ve now got to set up and slowly work through these projects so I don’t get insanely bored on bedrest! I’d love to know if anyone else has any further recommendations for baby sewing. I’ll be doing further blog posts once I’ve made a few things and be warned…you may be seeing more baby related posts around here too! I’m making burp cloths for my daughter to give away for her friends babies. They are 16″ x 26″. The size of a hand towel. Congratulations! Glad to hear your pregnancy is going well – try to rest up as much as you can you are going to need it soon! I’m glad you like the patterns! Hope to see them too if you manage to make some. Thank you, I’m resting as much as I can…not getting too bored yet but I’m working on having a few things lined up for when I do. Well I hope bed rest doesn’t bore you too much. Do you knit or crochet as they are good for keeping you busy when you can’t sit at a sewing machine. Not too bored yet so using this time to think about projects I could start or things I could be doing when I start to get bored. I have done some crochet but it’s been a little while. A great suggestion though to keep me busy! Thank you! I hope you manage to get some of these made before baby arrives, ‘cos you sure as hell will never find the time afterwards, lol! Modified bed rest sounds lovely to me, although I hope not boring in reality. An ideal way to concentrate fully on her imminent arrival and the perfect excuse to do all things crafty. Good Luck! Good luck with the rest and preparing for baby’s arrival. Oh my, there’s a whole host of inspiration on line to make lovely lovely things for little ones! I’m so sorry, I haven’t been keeping up with you. I didn’t know. Congratulations! To be honest, I’ve not been blogging that often so it would easily be missed! Thank you!